Product prices and availability are accurate as of 2019-04-19 10:27:22 UTC and are subject to change. Any price and availability information displayed on http://www.amazon.com/ at the time of purchase will apply to the purchase of this product. PaleoKrunch Cereal comes in re-sealable and re-usable containers, with 5 servings per container. ;This customer favorite packs a true cinnamon punch into every single bite! 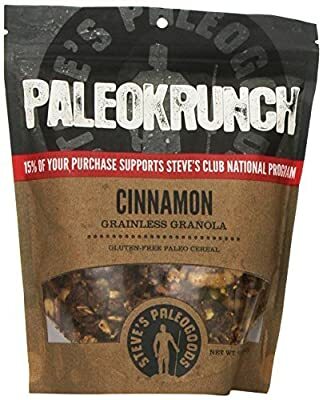 ;PaleoKrunch is gluten-free, grainless granola with our signature Krunchy clusters;Made from a delicious blend of coconut, raw pumpkin seeds, raw walnuts, raw pecans, raw almonds, raw sunflower seeds, a touch of honey, and, of course, CINNAMON! ;Enjoy this straight from the tub, with a splash of coconut milk, or with a handful of cacao nibs. It's perfection!